Have fun playing this Mahjong game where the time allotted in each of the eleven levels is limited and you will have to make the best use of the given time to score as many points as possible. 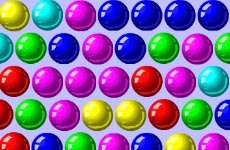 The tasks to be carried out in the game is to slide the tiles to link them with identical tiles to pop them out. Use the mouse to play the game and get relaxed.